I'm getting around, at last, to looking at my notes from Don Reichert's Nature Morph, a show of his work at the Gallery of the Canadian Embassy in D.C. I was there at the end of March for a bit of a Canadian-Culture blow out (represent, prairie provinces, represent! ), and was glad to see both work that I recognized (Reichert's wonderful, large, abstract expressionist canvases) and work that looked like a new direction (computer-manipulated images of the bridge and riverbank near Reichert's studio). Reichert's always been a very painterly painter at heart, with exquisite brush-stokes and a mastery of those drip and pour techniques we all know about from Jackson Pollack. There's even something calligraphic about him. But while he's grounded in that abstract expressionist tradition, he's always been curious about other things, and willing to tackle them seriously. I remember listenig as a kid in the 1970s to his haunting electronic music, for example, and I remember, too, a large exhibit which opened after the first Gulf War. That show came out of Reichert's travels in Mexico, where he's seen pre-Columbian art drenched in the imagery of human sacrifice. He picked this imagery up in some very powerful and disturbing pieces like Fuel for the Sun, which consisted of 100,000 individual sketches of skulls arranged into a giant wall. It looked Mayan, but represented the more conservative estimate of the number of Iraqis killed in that war (the title had to do with the Mayan belief that human sacrifices fueled the sun, but there was also something lurking in there about oil, and the connection of all those deaths to our deep addiction to fossil fuels). So he's always exploring different media, techniques and effects. --Some of Reichert's early paintings look like a strange cross between abstract expressionism and color field paintings, with canvasses divided geometrically between beautiful brush-stoked areas and flat colored sections. This work came out of some time spent in Spain, looking at the elegant abstract tilework and architectural ornamentation left by the Moors, but the fascination for Reichert really seems to have been in the juxtaposition of a very controlled, cool element and a more open, warmer, more organic element. 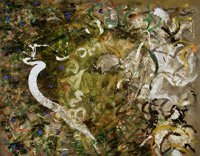 --Many of Reichert's large canvas works, the kind for which he is best known, include beautiful, warm, organic, layered elements that look like the moss-patterns that grow over decades on the granite outcroppings of the Canadian Shield. (If you ever watch Painter in the Landscape the CBC documentary about him, you'll see Reichert painting on canvasses spread over these rocks, and you'll see how he invites happenstance into his compositons, dousing areas with water, for example, to soften the effect. You'll also see one of my favorite art-documentary moments, in which Reichert, standing near an enourmous painting of his on a museum wall, is asked by a curator how far away he stands from these while he paints them. "Oh," says Reichert, "about five foot nine.") Anyway -- along with the layered organic elements you often find a hard edge or line, something straight or with a ninety-degree angle to it, something utterly unlike the natural forms that seem to have almost grown on the canvas. These come from folding the canvas over in the process of composition, but the effect is very strange, like a specifically human or technological intrusion. --The newest work at the Canadian Embassy combines natural imagery (photos of a the foliage along a riverbank) with very industrial imagery (big steel girders from a bridge), and it does so in a digitally-manipulated format that pulls it into almost crystaline patterns that, in their angles and symmetries, seem both geological-organic and technological. In all of these things we see a continued obsession with edges and growing things, with the mechanical form and the organic. You know, Reichert grew up in a little farm town on the prairies, and I'm willing to bet that the place he grew up in had something to do with these obsessions. What's a farm but the combination of machines and nature? Or, to put it another way, the meshing together of that which evolves naturally and that which we impose on nature? And farm guys have a combination we don't see in the sentimental suburbs: they know about nature but they also really, really like machines. There was more to enjoy besides the paictures at the embassy event that night, too. I ran into the art critic Robert Enright, for example, and tried to pitch an article to him about one of my favorite artists in Chicago, Jason Salavon (whose work you can see at his website) for his magazine, Border Crossings. Enright was all kinds of enthusiastic about this, and said many encouraging things to me about the article, about me being a poet, and so forth. Then he sent me over to talk to his partner and co-editor Meeka Walsh, who gave me a stern editorial look and a hundred (entirely worthwhile and defensible) criteria the article would have to meet to be right for the magazine. I saw right away why Border Crossings has been such a successful art magazine (check it out at bordercrossingsmag.com sometime) -- the Enright-Walsh dynamic of enthusiasm and judgment is exactly right for the Quixotic enterprise of art publishing. The night ended with a bunch of us rolling out of the embassy after too much wine, holding hands in a circle beneath the big postmodern rotunda, and discovering that it had exceptional echo-chamber acoustics when we sang an off-key and intermittently lyrically-challanged version of "Oh, Canada." Even without the paintings that would have been worthwhile.